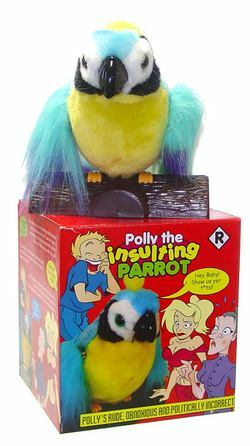 Polly the Talking Parrot looks like your normal every day stuffed parrot. When someone moves near by, the Talking Parrot sure can talk! When his motion detector is activated he cusses at you while his wings flap. "Does Polly want a cracker?". No, "Polly wants a [email protected]#$% cracker!". The Talking Parrot says this and several other funny phrases that will leave you and your guests totally shocked. Cussing Parrot requires 4 AA Batteries - not included. Talking Parrot is 8" tall and weighs 2 lbs. You've got to be so careful what you say these days, but our Polly the Talking Parrot isn't, and lets them rip with one sensitive and rude wisecrack after another. The Talking Parrot is one dirty little bird. Polly looks innocent enough sitting on his little perch, but when the Talking Parrot detects motion, he lets the expletives fly! In a fun parrot voice, Polly the Cussing Parrot insults anyone who crosses in front of him, and make you want to punt him like a football. Stick the Talking Parrot by the front door to meet and greet; in the kitchen, living room or even in your room to keep you company. The Talking Parrot is motion activated so every time you walk by, Polly will let fly with some rude comment. 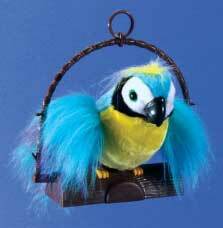 Talking Parrot comes with a perch that you can hang anywhere. Watch his wings flap up and down while he talks! Here are some of the Cussing Parrot sayings! Polly wants a @#$% cracker! Hey you! Go @#$% yourself! Hey Baby! Show us yer @#$%! Polly wants a b-job...ooohhhh feels good! Nobody loves you...everybody hates you! The Talking Parrot will have your friends and family on the floor laughing! 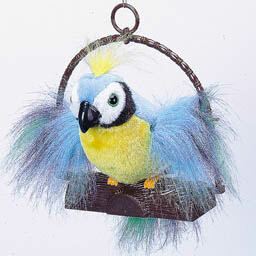 You wont believe your ears when you hear Polly the Talking Parrot. With 8 funny different insults, you will be entertained all day long! The funniest part is watching peoples faces when they hear this dirty little bird insult them! 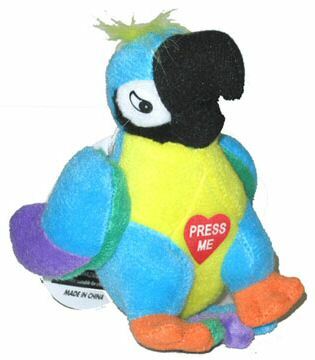 Our Talking Parrot is the perfect prank joke gag gift. Set Polly right next to the door to greet friends, family members, and customers. Polly the Talking Parrot also works great for when you are not home. Our dirty little bird will make sure he lets anyone know hes there when he senses motion. Set Polly in front of your front door window while you are gone. Once someone sees flapping wings and hears the Cussing Parrot crude insults, nobody will dare to enter your house! Polly the Talking Parrot is rude, insensitive, and has a "fowl" mouth! WARNING: The Cussing Parrot is an adult product and is not suitable for use by children. Cussing Parrot sound chip uses coarse language that may be offensive. Dont be suprised if the Cussing Parrot makes you and your friends laugh all day long. Your cat will even love the Cursing Parrot talking bird.